Made from high tensile strength nylon webbing with sewn on polyester/nylon ribbons. Easy care. Machine washable. Air dry. A luscious palette of colors perfect for the urban or country sophisticate. Up Country's ribbon collars are made from high-tensile strength nylon webbing with sewn on polyester/nylon ribbons for extra strength. They are stain and fray resistant and carefully designed to last a lifetime. They include a quick release buckle for safety which is US Coast Guard Approved for high weight hold. Machine washable. Air dry. Made in the USA. Please use the sizing chart below to measure your dog's neck for the correct size collar. Even though collars are adjustable and there is some overlap, you want to measure for your dog's comfort and for your peace of mind. Too loose and it can slip off; too tight and it might interfere with your dog's breathing. When measuring, allow for two fingers to fit comfortably between the collar and your dog's neck. Use a soft tape measure or a string, which you can then measure with a ruler. Make sure your dog is not holding its breath while measuring. Give your pup a special treat to reward him/her for their patience. 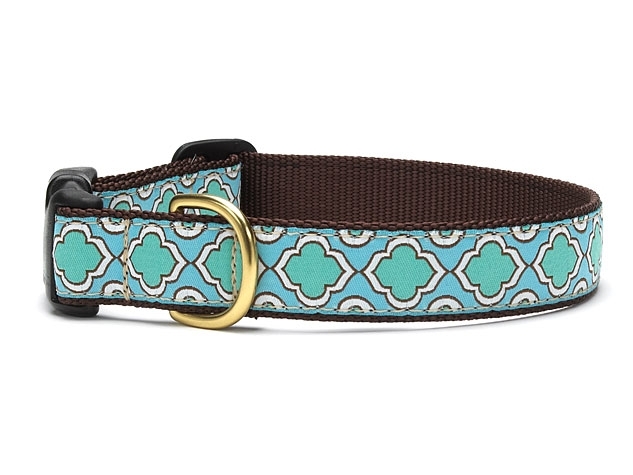 Collars, Harnesses & Leashes >Up Country, Inc.